In early 2017 Rimstone Cooperative initiated a contract to acquire the M-3 Cave and property. The Co-op is currently appealing for donations to help pay for it. Details of how to donate are given below. Our target is $30,000, which is the contract price and Rimstone is able to cover the on-costs. Photo at right: click on it for a larger image. You can assist with the purchase with a small (tax deductible) donation. See Shades of Death cave Appeal details below. The cave is situated 15 km North of Buchan just north of the Murrindal School House on the Buchan-Gelantipy Road. It is also known as Murrindal Moon Cave but the Shades-of-Death name goes back to Henham and Moon who first explored the cave in 1906. Shades-of-Death was developed as a Show Cave from the 1960’s. It was initially developed by Jack McMahon, an Orbost engineer, and three cavers (Graham Shaw, Geoff Rebbechi and Warren Kennedy). 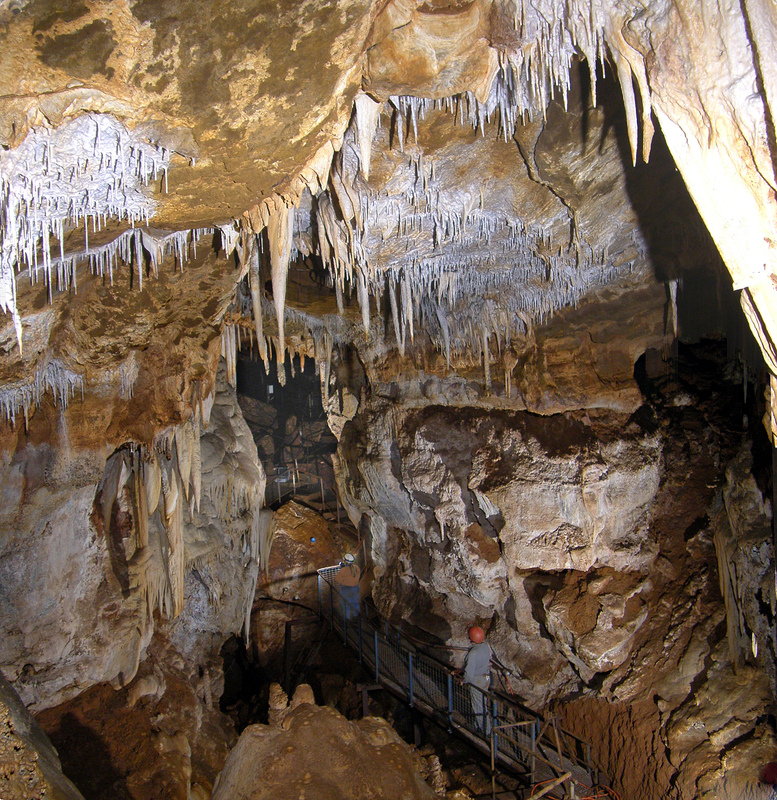 Geoff Rebbechi and Graham Shaw operated the cave for tourist visits during school holidays for many years. In the 1990s it was operated by Geoff’s brother Dennis Rebbechi and his wife Carol, and Kim and John Van Dyk kept it open for visitors after Dennis and Carol moved to Queensland. The cave has an entrance gate, built stairways and a lighting system. Geoff Rebbechi now solely owns the cave. The entrance is on an allotment of 0.4 ha, fenced with several sheds. Geoff Rebbechi is concerned that the cave and property needs to be well looked after in the future, which is why Rimstone Cooperative is purchasing the cave and property. The M-3 Shades-of-Death Cave Appeal - You can Help! Download the 2-page information sheet for more details about the funding appeal, and how you can help to own a piece of important speleo property and help ensure it is well looked after into the future. You can also download the Funding Appeal Donation Form now. There are several ways you can assist with tax deductible donations. Download and save the Appeal Donation Form, and choose your donation method. You can complete the details in the form on your computer (or tablet or smartphone), save the updated changes, then send the form to the address quoted on the form.